In 2019, the House of Hope is not only involved in the protection of abused children or children living in extremely precarious conditions, but also seeks to prevent these situations through various projects such as the creation of child protection committees at village level, awareness-raising sessions towards a positive and caring parenthood, the development of income-generating activities for families with very low incomes or the launch of a resource centre in the Foundation's garden. 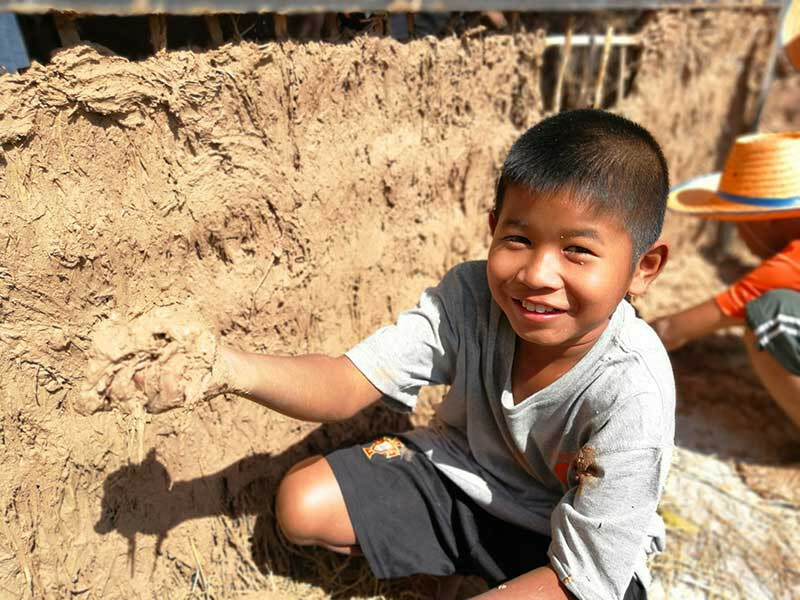 An "earthen construction" workshop was organised in that resource centre on 26 January for some fifty participants, including the children of the House of Hope, the "young leaders" of the Pimrat secondary school as well as children, parents and other local actors from three surrounding villages. Often neglected in modern constructions, pisé, cob, mud bricks or adobe are clay construction techniques that have been used for centuries on all continents and have many advantages. A natural and local resource, 100% recyclable and non-polluting, the use of mud makes it possible to build homes with low energy consumption and real thermal comfort at a lower cost. Architect Anne-Lyse Antoine, a specialist in earthen construction, confirms this: “Mud is a material that releases heat in a delayed way: if it is hot outside, the heat is released twelve hours later; however, the mud remains cool during the day”. A particularly interesting property in Thailand where the variation in temperature between the day and the night often reaches 15 degrees. With the technical support of volunteers, our young aspiring architects have stepped in (as seen in photos!) to start building an earthen building in the garden of the House of Hope, a building that can be used later as a meeting room to facilitate future workshops or as a music room for the children of the House and the community. The beneficiaries of this workshop did not wait long before applying their skills since the next day, the children of the House of Hope went to build toilets and a shower room in the house of the young Aomsin, 9 years old, previously accommodated in the House of Hope. Aomsin went back to live with her grand-father but his house had no toilet or shower and Aosmin and him had to use the bathroom in neighbouring houses. This type of precarious housing is part of a list of 160 cases already examined by social workers and where work began in January. This workshop and its practical application have demonstrated that with very low construction costs and a spirit of solidarity among community members, it is possible to improve the housing and living environment of the most disadvantaged families. Next workshop scheduled in the resource centre of the House of Hope: groundwater extraction and development of a continuous irrigation system. Also a very relevant theme in a province that suffers from drought and water shortage every year.